Interests: Writing. Music. Jazz. Sci I'm the author of the James Blake Thriller series (TAKE NO MORE, REGRET NO MORE and FORGIVE NO MORE) and the psychological thrillers EACH DAY I WAKE and SUGAR FOR SUGAR. A third psychological thriller HERE THE TRUTH LIES is now available. I'm also the author of the the sci fi thriller DOUBLE BIND. To ask Seb Kirby questions, please sign up.
" Hi! I’m Seb Kirby. Thanks for the invitation to join. I already recognise a few here (Hi, Alex! Hi, Elyse!) and hope to get to know everyone more. I w Hi! I’m Seb Kirby. Thanks for the invitation to join. I already recognise a few here (Hi, Alex! Hi, Elyse!) and hope to get to know everyone more. I write thrillers. I’m currently working on my eighth title. 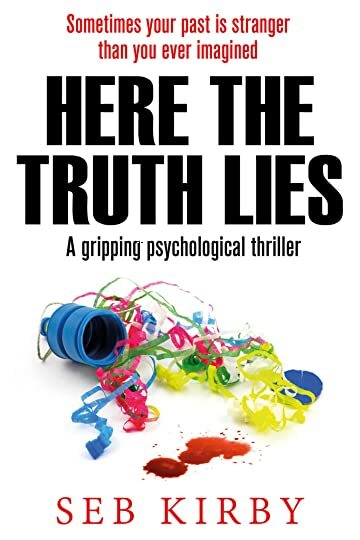 A full listing of my books is avalailable here: http://sebkirbyauthor.blogspot.com ...more "
HERE THE TRUTH LIES is available in both US English and UK English versions. The links below take you automatically to the correct version for your country. If you prefer a print edition, that's ava HERE THE TRUTH LIES is available in both US English and UK English versions. The links below take you automatically to the correct version for your country. HERE THE TRUTH LIES is a standalone story. It's not necessary to have read any of my earlier stories. However, it's my third psychological thriller set in the same locations - London, particularly around the South Bank of the Thames, Borough Market and the East End. The two earlier stories are also standalones. All three feature the same investigators (Ives and Lesley) but the main character and the story that unfolds is distinct and separate in each case. So, you can begin reading these stories in any order. I’m alone in the bed, unable to sleep, my eyes wide open, willing darkness. One of those who needs complete absence of light. This means, as a minimum, full blackout curtains to take care of the lamps in the street outside. Even then, I detect stray splinters of light appearing around the edges of those curtains once my vision adjusts to the supposed blackness. This involves using the bed sheets to cover my head just enough to shade my eyes while leaving space to breathe. It’s a ritual that, once complete, is an essential prerequisite to any more sleep this night. But here I am, awake, aware that something is wrong with the room. I close my eyes. Too much is happening in my mind. Above all, McLeish, my boss, is hounding me for progress on the Stanley story. I doubt I’ll get back to sleep again but I must try. A faint noise, a rustling sound, comes from the corner of the room. I don’t want to look. I’m phobic about moths, spiders, crane flies and anything with spiny legs. It could be one of those or, worse, a mouse. Nocturnal visitors are more than likely in the ground floor rooms I rent in this old Victorian house. It’s at times like this I wish I were with someone. But I live alone now that Mark has given up on our marriage and gone to work in Prague. I miss him, yet value the feeling of independence. But now I want someone beside me to say: Emma, what’s that? I raise my head from the pillow and turn toward the sound. It’s a young girl. The rustling is made by her nightdress dragging on the ground as she walks towards the bed. I look away and dig my fingernails into my wrist so hard I fear it might draw blood. The pain is intense. I need to know I am, in fact, awake. I turn my head back. The girl is still there but she has stopped still now and is standing looking straight at me. She is nine or ten years old with curly blonde hair. Her blue-green eyes hold a look of fear that tells of great suffering and sadness. She is speaking, her mouth opening and closing, but I can hear no words. Yet I’m sure from the way the girl stares at me that whatever she is trying to say is meant for me. The girl’s lips stop moving for a moment and her eyes widen, as if she’s heard what I’m saying. As she mouths silent words again, I strain to decipher them. It looks like I’m here now. And now, perhaps she is trying to say her own name. I’m Jenny. I can’t be sure. The little girl says no more. Instead, she turns and retreats to the corner. I raise myself from the bed. “Come back. I need to know who you are.” But, by the time my feet touch the floor, the girl is gone. My eyes search the room, looking for any sliver of light. There is none. All is once more pitch black and silent. As I lie back down, my heart is racing. My nightclothes are heavy with sweat. There is no chance of sleep now. The same journey to work each morning. Walking out of London Bridge station, skirting the Shard with its ever-present ground wind that all but blows me headlong down London Bridge Street towards the spire of Southwark Cathedral. This is how each workday begins. As I walk, my mind turns over. No sleep last night. I don’t want to think about the young girl I know as Jenny who came to me in the darkness of my room. But the image of that troubled face keeps appearing before me, here amidst the tumult of London in the rush hour. And then there’s the Brian Cooper story, the issue that has already resulted in so many sleepless nights. The evidence for murder is circumstantial, anyone with eyes to see should realise that. But few do, not even my friend Sophie Taylor. Sophie doesn’t understand. There are some things you just know are right, though everyone tells you otherwise. That’s how it is with Brian Cooper. I pause these thoughts to take care while crossing the busy highway that passes close by the Cathedral. Teeming with cars, buses, taxis and freewheeling cyclists weaving between the onrushing traffic running downhill from London Bridge itself and on beneath the overhead railway into the turmoil of Borough High Street, the road is a physical barrier to the tranquillity that lies on the other side. As I wait to cross, the metallic structure of the railway bridge above amplifies the sounds below. Most days I’m able to filter them out – but not this morning. The cacophony assaults my senses, makes my ears ache and my mind reel. That’s what another wakeful night can do. And now it’s starting to rain. Crossing the road when the traffic lights call me on, I aim for the walkway that runs between Borough Market and the Cathedral itself. As I clatter down the stone steps leading from the roadway to the Cathedral grounds below, my thoughts return to what Sophie says about Brian Cooper. That’s the problem. If I were being honest, I’d have to admit there is no way of being sure. For every innocent man serving time there are ten more denying they are guilty as charged. What makes Brian Cooper any more special? As a journalist, I know I have a duty to be sceptical about claims made by anyone and everyone until evidence proves otherwise. People try to get to you in the belief that the Press is the place to be heard once all other avenues of appeal are exhausted. Your training prepares you for that. Yet I’m drawn in to Brian Cooper’s story by what feels like an irresistible force. And when I speak to him, that attraction grows stronger. Even though I can’t hear in him the clear-cut voice of truth. He comes over as his own worst enemy. Someone better educated would sound more convincing. That’s what prevents Sophie, and other criminal defence lawyers like her, from taking up the case, despite the evidence against Brian Cooper being circumstantial and resting on a single witness who identified him at the murder scene. But that’s just why I feel compelled to investigate. If he were quick-witted and slick in his replies, I’d be concerned I was being conned. Inarticulate men like Brian Cooper are always likely to be the victims of miscarriages of justice. I reach Cathedral Street, heading towards the river. A stranger approaches and is on the point of saying something before walking on past me. I know what’s passing through the man’s mind. It’s a reaction I encounter more often than I like. For a moment, people I’ve never met recognise me and are convinced they must know me. But then they realise why. My appearances on the late night news channels reviewing the next day’s newspapers have made me a minor celebrity. At least amongst those who worry more about the state of the world than getting a good night’s sleep. As I turn onto Clink Street and take care to pick my way across the cobbles without ruining my high heels, I try to concentrate on the business of the day. The reason the Herald keeps paying my salary. The answers my Editor, Bill McLeish, is waiting for. I make it onto Bankside. There is the Thames at high tide and in full flow. The life-blood of this city, why since Roman times any of this is here. I skitter on, turning my coat collar against the rain blowing in from the river and threatening to soak me before I reach the office. Something makes me turn as the Thameside walk threads its way under a short tunnel beneath Southwark Bridge. I’ve noticed the man in the black overcoat before, in the same carriage on the train as it came into London Bridge. He’s been behind me all the way from the station. Why is he following me? This feels different from the casual recognition of a stranger who’s seen me on TV. More premeditated. I try to tell myself this is just paranoia brought on by nights without sleep, but my suspicions won’t go away. I hurry on, trying to make it to the end of the tunnel. Is my follower about to attack? Is this the ugly side of the minor fame that the TV paper review appearances have brought me? Some head case prepared to turn into reality the sexual abuse and death threats I receive on social media without fail every time I speak out against the conventional wisdom of the mainstream press. I wouldn’t be the first woman to be attacked for speaking out. In a city of eight million why, all of a sudden, am I here, so alone? The Herald building is little over two hundred yards beyond the end of the tunnel. If I can make it through the front door into the lobby, I’ll be safe. I hurry on. I don’t want to look behind again but fear compels me. The man is gaining on me. If he doesn’t mean harm, why is he closing the gap on me when all the way along Bankside he must have been keeping a respectful distance? I begin to run and curse the choice to wear high heels today. My efforts make no difference, he is right behind me, within arms reach. A couple, arm in arm, appear at the other end of the tunnel, walking towards me. They will witness what happens. The man brushes past me without touching me, pretending, no doubt, that he has never meant me harm. I slow and allow him to go ahead and exit the tunnel. I smile at the couple as they pass, engrossed in conversation with each other. When I emerge into the daylight, my follower is nowhere to be seen. He’s been spooked by the sight of the advancing couple, I’m certain. My heart is racing. I take deep breaths. Write this off as a narrow escape. Try to find a different route to work tomorrow. I make it to the welcoming front doors of the Herald building with feelings of real relief and rush inside. All thoughts about Jenny are now buried in the pressing business of the day. At least there is some comfort in that. We’d love your help. Let us know what’s wrong with this preview of Here the Truth Lies by Seb Kirby. Looking forward to hearing from everyone..... "
Seb added a status update: Villains - and why I like writing about them.
" Miriam, Thanks for the great, perceptive review! " HERE THE TRUTH LIES is launched on Ebook on 24th May. The Ebook is available on preorder at the special price of 9 HERE THE TRUTH LIES is launched on Ebook on 24th May. (Full price will be $2.99 / £1.99 shortly after publication day). Discussion forum to bring together readers on Kindle (and other ebook formats) with authors. Hello Seb, it is a pleasure to meet you. Seb, thank you for the friendship. Tarn Howes...know it so well. Beautiful. Thanks for looking me up, Seb.